Hi everyone! A few quick things to let you in on! Fifty reviews! Wow! That’s by far the most reviews I’ve had on any of my books. Also, to be real, I got a lump in my throat this morning. To write books that stirs something in people is the most any writer could hope for and I’m sincerely grateful I’ve dug the screwdriver into the pleasure center at the right angle this time. Soon I’ll return to an office I worked in fourteen years ago. A friend asked if i was okay with that, given that I closed my practice two years ago so I could write full time. I said yes, I’m okay with that, but only because of of you and the success of This Plague of Days. Without my readers, I’d be going back feeling like a failure. Instead, I’m optimistic. I’m finding my audience and my audience is finding me. If that takes more time, it’s worth the wait. It’s corny, I know, but you are helping me fulfill the dreams I had when I was six years old. Sincerely, thank you so much for reading my books and digging my sour worldview for entertainment purposes. If you’re reading Season 2 as a serial, the cover below is what the latest episode looks like. I know most people get the difference between episodes and seasons and I’ve been careful to explicate. Still, I know there is some confusion about serialization. If anyone clicks the wrong episode, Amazon is great about returns and refunds. The great thing is, I now notice more readers are letting go of reading episodes and are just clicking on the full seasons. However you want to eat the chocolate neuro-fudge, it’s warm as blood and waiting. Thanks! Kit Foster of KitFosterDesign.com is my graphic designer. Nice and talented in one package. If you need a web banner or a cover, check out Kit’s work. Kit’s work doesn’t stop with great book covers. He also supplied me with great artwork for my new business. I’m starting November 4 and just getting things pulled together and sorted out. If you ever wonder why I don’t already have the paperbacks lined up and out there, there’s a distinct lack of interns and staff around here and my family refuses to wear the Oompa Loompa outfits. This Plague of Days Seasons One and Two are bestsellers, but no, I’m absolutely not in the plus column yet. I took two years off work to set up Ex Parte Press and I need to supplement my income to take the firm to the next level. I’m not quitting writing. I’m adding enterprises so I can fund book promotion efforts and let the kids have lunches and suppers again. I based this economical measure knowing that, since breakfast is the most important meal of the day, we’d save a lot of cash nixing the other two meals. I’m also playing the lottery wicked hard and I assume that ploy always works out, right? Here’s my new website and practice, if you’re curious. For other books of suspense, there are more options. If you liked TPOD, try Murders Among Dead Trees, for instance. To buy more books by me, check the right sidebar for affiliate links at AllThatChazz.com. Thanks again! 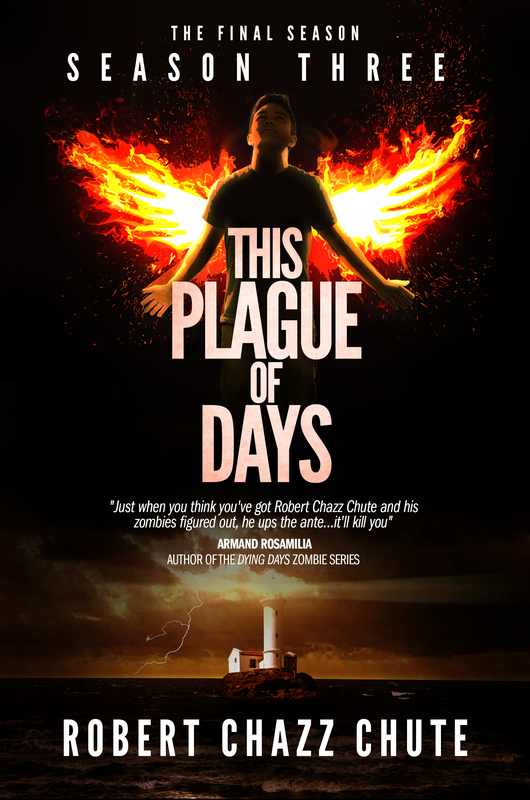 This entry was posted on Monday, October 21st, 2013 at 3:46 am	and tagged with amazon, Apocalyptic and post-apocalyptic fiction, book covers, books, business, cover reveals, dystopian, ebooks, horror, horror serial, Paperback, Plague of Days, reading, robert chazz chute, Serialization, This Plague of Days, vampires, zombies and posted in the book, the serial, This Plague of Days. You can follow any responses to this entry through the RSS 2.0 feed. 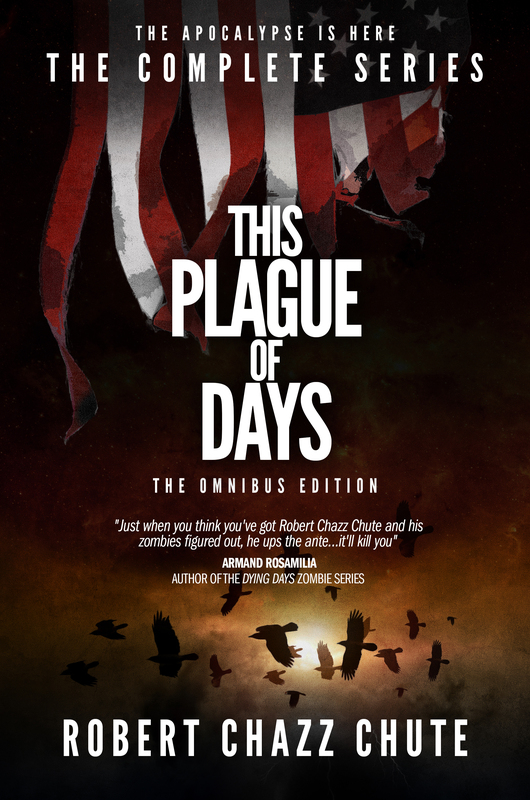 « This Plague of Days Q & A (Part 6): Why do we have to wait so long?